It hasn’t been long that Renault introduced 5 Alpine hatch, with some mesmerizing looks and features that now we have another one coming from them at the Frankfurt Motor Show 2015. 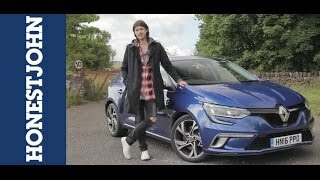 To be mentioned that unveil of Renault Megane GT 2016 commendably grabbed the attention and with this company marked another benchmark in the hatchback segment. 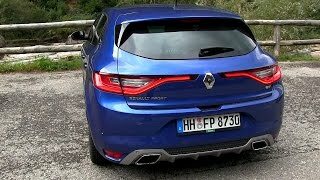 Let us not delay and have a look at the review of Renault Megane GT 2016 to know more about it. The interior of Renault Megane GT 2016 is just as you can expect from a GT. It carries innovative looks and features that will make you stay in cabin worth all the pennies. Talking about the technology the model is very well equipped with a head up display and a massive infotainment screen. The controls have been located appreciably and keep the neatness you can’t resist admiring. The blue black color scheme primarily makes the interior, for example it has blue and black Alcantara stripes over the upholstery, the steering wheel, door panels and the dash. The essence of blue stitching can also be noticed in form of stitching over the steering wheel and gear shift lever. 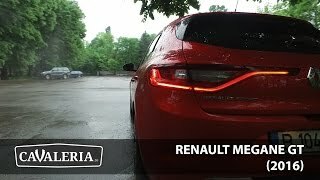 In all, wounding up the entire interior details of Renault Megane GT 2016 I would say it is impeccably mesmerizing and gorgeous. The exterior of Renault Megane GT 2016 is way ahead of the regular Megane. The differences between the regular model and this GT primarily spread the wings to lower air intake which for this version has side scoops, also the side mirrors which get a metallic paint finish instead of coming in body color. Moving towards the rear fascia you’ll notice a diffuser that gives a touch of aggression to the model. Coming standard the model comes drenched in ‘Iron Blue’ paint and rolls over massive and sporty 18” wheels. 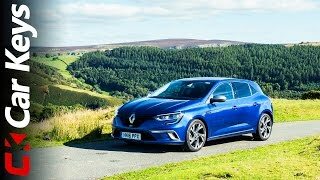 In all the exterior of Renault Megane GT 2016 might not be entirely like that of GT but the changes and inclusions undoubtedly separates it from the regular model. 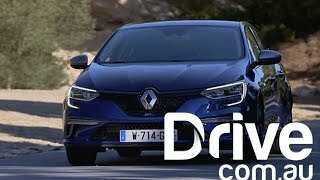 From beneath the hood of Renault Megane GT 2016 the engine cranks total output of 205 hp and comes paired to a seven-speed dual-clutch transmission. This is all that has been shared by the company however we expect the performance figures, especially the engine type and top speed of Renault Megane GT 2016 to be unveiled soon.